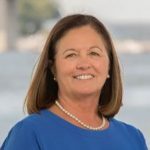 Old Lyme First Selectwoman Bonnie Reemsnyder announced today that a contract has been signed with CWPM Waste Removal and Recycling Services to provide collection services for trash and recycling in the Town beginning July 1, 2019. In a press release, she offers special thanks to Old Lyme Selectman Chris Kerr, Old Lyme Board of Finance Member David Kelsey and current trash/recycling service provider, Gary Yuknat of Old Lyme Sanitation, for their hard work in developing an Request for Proposal (RFP), reviewing the bids received, and their input on the contract that was signed. The graphic at this link reminds residents”What’s In and What’s Out” in terms of recycling — please take note! 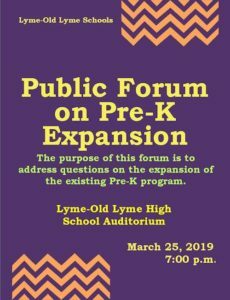 Lyme-Old Lyme Schools are hosting a Public Forum on Pre-K Expansion, Monday, March 25, at 7 p.m. in the Lyme-Old Lyme High School auditorium. The purpose of the forum is to address questions about the proposed expansion of the existing Pre-K program. 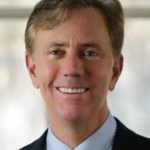 The Chamber of Commerce of Eastern CT Foundation has announced the distribution of $120,000 to 37 eastern Connecticut non-profits that will improve the quality of life for thousands of children in the region. This year’s disbursement reflects the highest-ever amount distributed by the Foundation and marks a twelve percent increase over the 2018 grant disbursement. 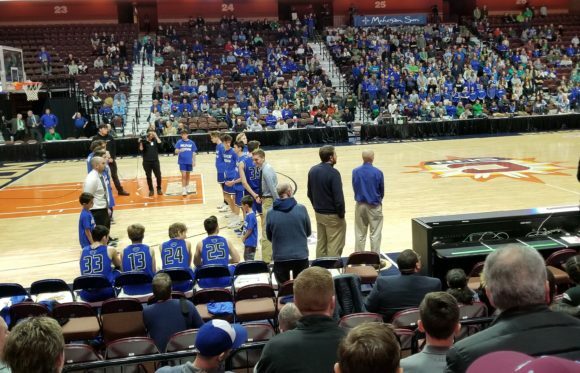 The Foundation raised funds throughout 2018 with fundraisers including the 7th Annual Bowl-a-Thon at High Rollers Luxury Lanes at Foxwoods Resort Casino in April and the 35th Annual Holiday Gala held at Mohegan Sun in December. “Thank you to all our sponsors, committee members, volunteers, Foundation board members, and staff at the Chamber. Putting these events together is a team effort, and everyone involved played a critical role in our success,” said Ziegler. Since 2002, the Chamber Foundation has donated more than $1.3 million to numerous local organizations that serve the needs of children. The Foundation’s goal is to support projects and programs that enhance and enrich education and economic opportunities for children and families in the Chamber’s service area. This year’s recipients will be able to use funding to provide participation in regional activities, toys and books, school supplies, healthy nutrition, winter clothing, intervention for at-risk children, and food pantry items, among many others. Horses Healing Humans: $500 to provide a common ground equine-assisted activity program for Stonington Middle School girls. Montville Little League: $500 to fund a scholarship program to distribute to children for registration fees. The Center: A Drop-In Community Learning and Resource Center: $1,000 for additional support with supplies, transportation, and field trips for the Summer Enrichment Program. Children’s Museum of Southeastern CT: $1,000 to provide monthly sensory-friendly programming at the Museum for families with children on the autism spectrum. Eastern CT Symphony Orchestra: $1,000 for scholarships for participants in need of financial aid in the Eastern CT Symphony Youth Orchestra and Strings Ensemble. Hygienic Art: $1,000 to support Artist Academy Jr. which fosters an interest in reading and the arts for young children and their families. 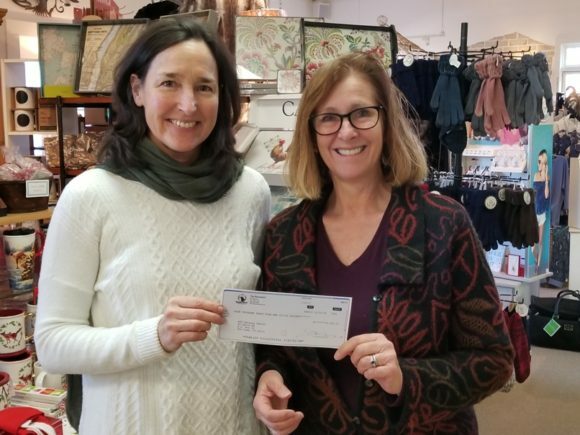 The Rotary Club of Norwich: $1,000 to support the Rotary Coat Fund which provides winter coats to children from low-income families in the greater Norwich area. S.T.E.P.S. Inc.: $1,000 to provide part of the total funding for two full weeks of free Summer Leadership Training in July and August 2019 to middle school girls ages 10-18 in Groton, New London, and Norwich. Eastern CT Community Gardens Association: $1,000 to support planting and care of gardens at various elementary schools for students to tend. 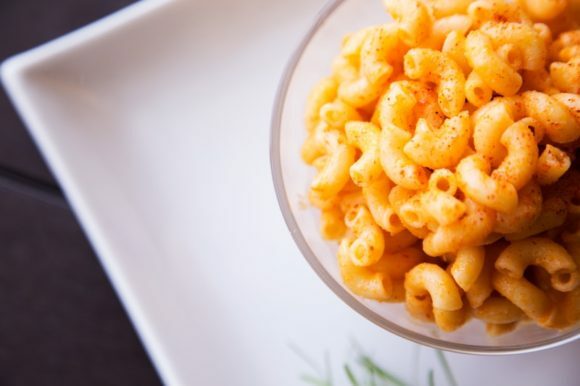 Groton Community Meals: $1,115 to purchase food and supplies needed for weekly dinners for local residents in need. Shiloh Development Corporation: $1,160 to maintain the safety and quality of the preschool’s indoor play area by repairing items affected by wear and tear. Channel 3 Kids Camp: $1,225 to help campership support for children with disabilities and children considered “at risk” from New London County. Catholic Charities, Diocese of Norwich: $1,500 to purchase diapers, wipes, and formula for newborns to help struggling single mothers with families and their children. New London Main Street: $1,500 to help with expenses and entertainment, including a children’s tent with educational activities during the Connecticut Family Festival. Norwich Community Backpack Program: $1,500 to purchase 850 new backpacks and age-appropriate school supplies for low-income youth in Norwich. Southeastern Regional Action Council: $1,500 to support the implementation of the 13th Annual Youth Forum in spring 2020. Thames River Community Service: $1,800 to support the children’s summer program. Child and Family Agency of Southeastern CT: $2,000 to help with renovating the playground at the Groton-Mystic Early Childhood Development Center. Expressiones Cultural Center: $2,000 to support the ArtVenture Program which will provide culturally relevant bilingual arts and educational programming for children in New London schools. Norwich Human Services: $2,000 to provide school uniforms to children of low-income Norwich families for the 2019-20 school year. Pregnancy Support Center: $2,000 to support the Pregnancy Decision Program which provides limited medical services and material assistance to women and teens experiencing unplanned pregnancy. Thames Valley Council for Community Action: $2,000 to support the Santa Boots project which provides new winter boots for children from low-income and working families throughout eastern CT.
FRESH New London: $2,500 to support the Fresh Crew youth program which combines hands-on skills with community empowerment to make a long-term impact on the food system in New London. High Hopes Therapeutic Riding: $2,500 to support the VetKids program which provides children of veterans with equine-assisted activities that promote skill development and team-building. New England Science and Sailing Foundation (NESS): $2,500 to support NESS’ programs in New London which provide water-based educational experiences that transform students’ lives. Safe Futures: $3,000 to be used toward providing children who have impacted by traumatic experiences the opportunity to attend Camp HOPE America – Connecticut. Sea Research Foundation: $3,000 to support the “Where the City Meets the Sea” project to hep Norwich and New London teachers educate students about the ecology of Long Island Sound. United Community & Family Services: $3,000 to pilot a project designed to assist patients who experience transportation barriers to attend healthcare appointments. Madonna Place: $3,200 to fund a portion of the “Great Beginnings” program, which provides screening and assessments to identify high-risk pregnant women and offer intensive services for their child’s first few years of life. Higher Edge: $3,500 to continue the College Access and Success programs. Always Home: $5,000 to support homelessness prevention/shelter diversion of New London County families seeking emergency housing assistance. Eastern CT Workforce Investment Board: $5,000 to be used toward expanding the number of disadvantaged youth that the organization will be able to serve in the 2019 Summer Youth Employment program. Riverfront Children’s Center: $5,000 to purchase new equipment to create an outdoor infant/toddler classroom. St. Vincent de Paul Place, Norwich: $5,000 to provide peanut butter and cereal to children whose families participate in the St. Vincent de Paul Place food pantry. United Way of Southeastern CT: $5,000 to procure healthy and nutritious food to be distributed through the Gemma E. Moran United Way/Labor Food Bank’s sixty-nine feeding sites, serving 5,700 children each month. Tommy Toy Fund: $17,500 to support the goal of providing two toys, one book, and a pair of gloves to low-income children. Miracle League of Southeastern CT: $25,000 for seed money for the design and construction of a Miracle League field that will serve eastern CT children who face physical and developmental challenges. In addition to the $120,000 granted to these 37 non-profits, the Chamber Foundation will award $1,250 each to four eastern CT high school students ($5,000 total) later this spring. High-achieving high school students who have a demonstrated interest in serving their local communities are encouraged to apply for a scholarship by visiting ChamberECT.com/foundation. The deadline for applications is April 15, 2019. The Chamber Foundation will continue to raise funds through events in 2019 including the 8th Annual Bowl-a-Thon on April 9 and the 36th Annual Holiday Gala on Dec. 6. To learn more, register, or find sponsorship opportunities, visit ChamberECT.com or call (860) 701-9113. Learn more about the Chamber of Commerce of Eastern CT Foundation at ChamberECT.com/foundation or call the Chamber of Commerce of Eastern CT office at (860) 701-9113.
ii) The Chamber of Commerce of Eastern Connecticut is a collaborative of business and community leaders dedicated to securing and enhancing the economic vitality of eastern Connecticut. The Chamber works to create value for its members and the region by providing forums for business networking, leadership and discussions of issues that affect the region; providing opportunities for members to showcase their products, services and accomplishments; helping small businesses succeed through educational programs; and working to reduce the costs of doing business in Connecticut. For more information, visit ChamberECT.com. File photo of the Chandler Academic Center at Lyme Academy College of Fine Arts. 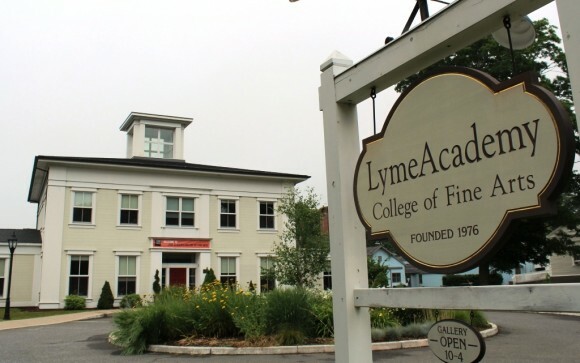 The board of trustees of the newly-renamed Lyme Academy of Fine Arts in Old Lyme, Conn., has announced an extensive summer art program for youth and adults. “Our trustees, alumni, and the Old Lyme community are committed to supporting this historic art institution,” states Stephen Tagliatela, Lyme Academy Board of Trustees Chairman. Screen shot of the homepage of the new Lyme Academy website at LymeAcademy.org. The 2019 summer programs at the Lyme Academy of Fine Arts for adults will begin in May and be offered through June, July and August. The youth programming is offered in July and August. High school students with beginning to advanced level art training can enroll in a series of courses that further explore and expand their technical skills and abilities. All Pre-College courses and workshops are designed to foster creativity, build artistic skill, portfolio development, and mentor personal vision in young artists. The Lyme Pre-College Academy runs an intensive series of weeklong, daytime classes during July and August with instruction by master artists. 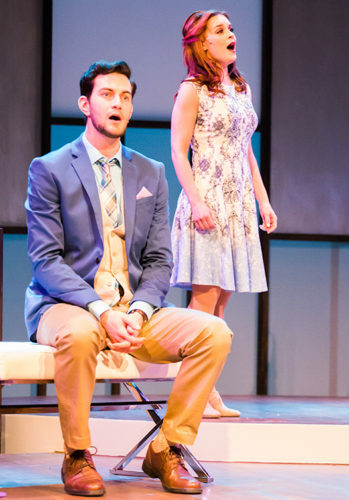 Immerse yourself in a college-level arts experience this summer. Middle school students will participate in an exciting art camp that showcases famous artists from history. Students will engage in art projects based on the talents, examples of work, and significance of each featured artist to make their own body of work full of fun and insight into the creative process. 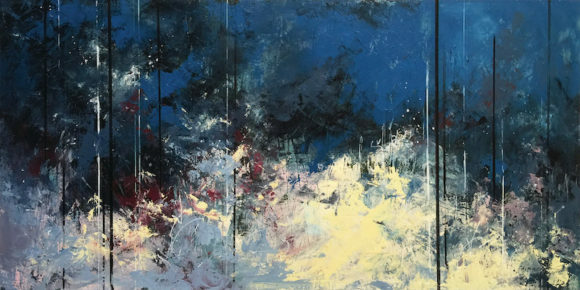 Learn from historic artists and art movements while exploring your own talents! Featured artists this summer include Edgar Degas, Michelangelo, Salvador Dali and Leonardo da Vinci. Classes begin July 8 and run weekly through August 2. 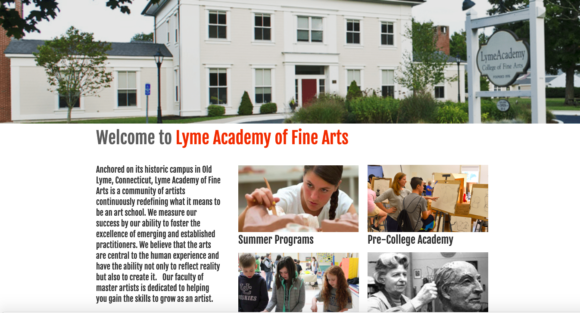 Lyme Academy’s traditional methods in figurative and representational art will provide adults at all levels an opportunity to work with professional artists, build portfolios, while advancing their skills in various mediums and techniques. Adult classes present an opportunity to immerse yourself in concentrated study in a specific area of expertise. 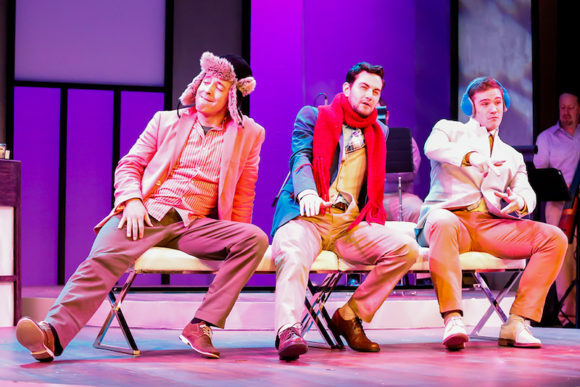 Students will gain new perspectives in the process and the unique experience of guidance by professional artists in a mentored environment. Adult weekly courses begin in May and the workshops and master classes will be offered in June, July and August focusing on developing technique and accelerated skill advancement in figure drawing, landscape painting, printmaking, sculpture, and encaustic. Editor’s Note: Founded in 1976 by esteemed sculptor Elisabeth Gordon Chandler, Lyme Academy of Fine Arts is located in historic Old Lyme, Conn., which has been a vibrant center for the arts and artists in southeastern Connecticut for more than 100 years. The Academy offers a variety of programs in art education under the guidance of master artists who share a deep respect for both traditional and innovative forms of teaching that provide students with the necessary foundation and skills to develop their own unique visual expression. For more information about Lyme Academy’s summer youth and adult art programs, visit www.lymeacademy.org or contact Kristen Brady at kbrady@lymefs.newhaven.edu or (860) 598-5143. ‘Winter Song’ in oil by Katherine Simmons is the signature painting of the ‘Explorations’ section of the ‘Four Acts’ exhibition. 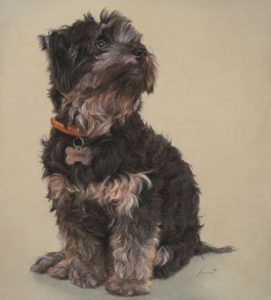 ‘Darby’ in pastel by Anderson Flanders is the signature piece of the ‘Animal Kingdom’ section of the exhibition. The Four Acts opening reception is Sunday, March 17, from 2 to 4 p.m.
Gallery hours are Wednesday through Sunday, from 10 to 5 p.m, and by appointment. Admission is free but a $5 donation is suggested. Lyme Art Association is located at 90 Lyme Street, Old Lyme. Today at noon, the state legislature’s Planning & Development Committee will hold a public hearing on House Bill 7319, An Act Concerning The Fiscal Independence Of School Districts. The hearing will be televised on CT-N. 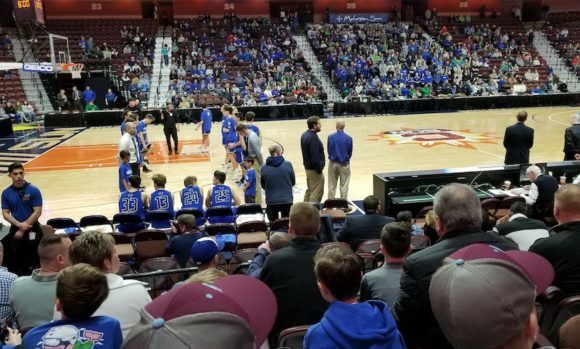 The bill was introduced by the Planning & Development Committee and is applicable to all local and regional school districts in the state, except for five: Hartford, Bridgeport, New Haven, Waterbury and Stamford. For more information on the broad topic of forced school regionalization, visit HandsOffourSchools.org or their associated Facebook group, Hands Off Our Schools, which is strongly opposed to the proposals made to date. Brady Sheffield shoots during Thursday night’s semifinal game against Somers. All photos by Emily Gerber Bjornberg. 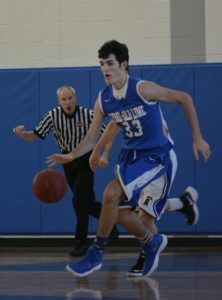 Old Lyme defeated Somers 69-53 in last night’s semifinal game played at Maloney High School in Meriden. Junior Ray Doll was top scorer for the Wildcats with 24 points for the Wildcats while junior Aedan Using had 23. Wildcat coach Kirk Kaczor watches as junior Aedan Using shoots during Thursday’s semifinal game. 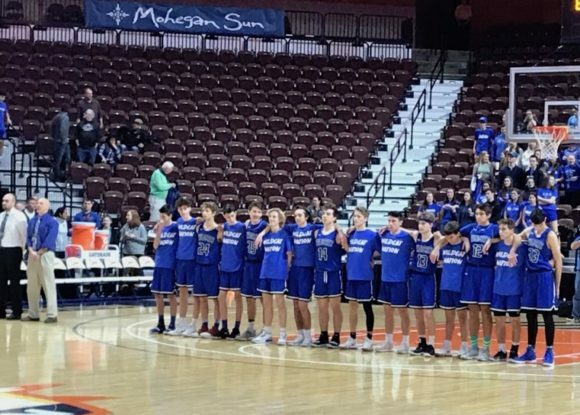 The Wildcats will now meet top-seeded Innovation in the championship final on Sunday at 10:30 a.m. at Mohegan Sun Arena. The Old Lyme bench anxiously awaits the next call to go on court. 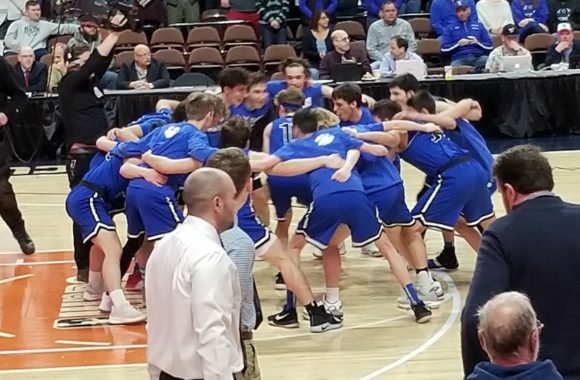 Visit this link for game highlights by Peter Huoppi published Wednesday, March 13, on theday.com. Aedan Using (#33) takes advice from Coach Kaczor during last night’s game. All photos by Emily Gerber Bjornberg. 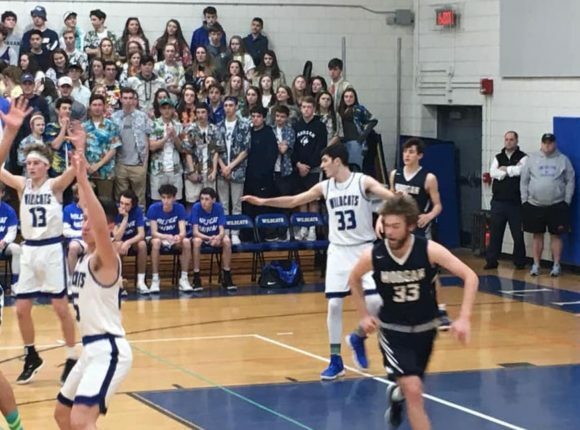 Third-seeded Old Lyme romped to a 61-31 victory over #6 seeds Morgan last night in front of a boisterous, sold-out home crowd. 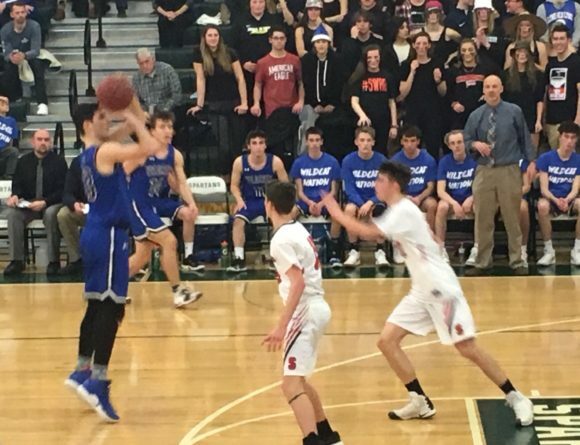 The Wildcats now go straight into a CIAC Division V semifinal match-up tomorrow with second-seeded Somers at Maloney High School in Meriden. 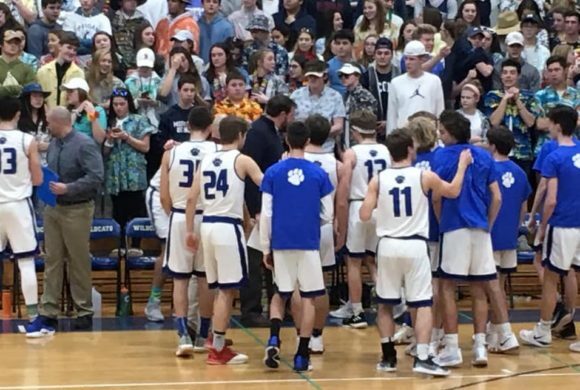 Tip-off is at 7 p.m.
Top-scorer across both teams was Old Lyme junior Aedan Using with 22 points, while Brady Sheffield notched 17 points and Ray Doll 10 for the Wildcats. 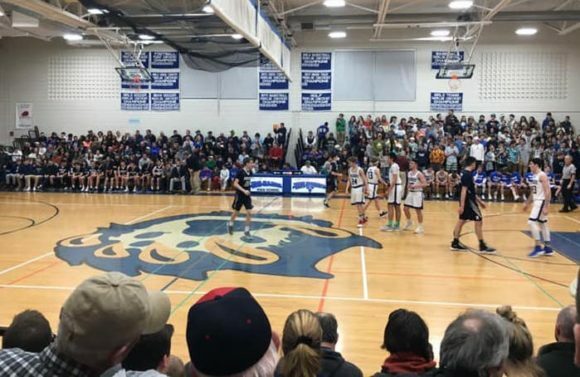 The Old Lyme gym was packed to capacity for the semifinal game. The team receives some advice during a time-out. 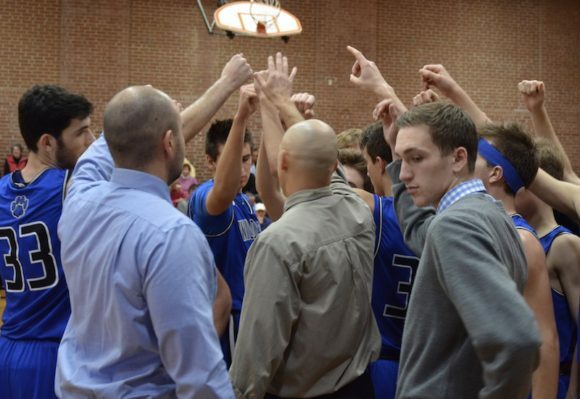 The last time Old Lyme was in the semifinals was in 2013 when the team faced Capital Prep. 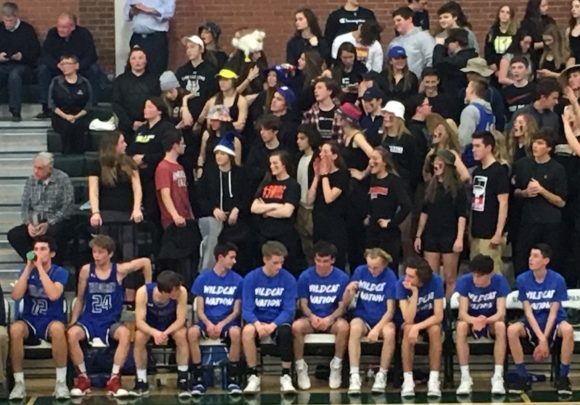 In a gritty game, despite taking the lead in the third quarter, sadly the ‘Cats failed to clinch victory that night. 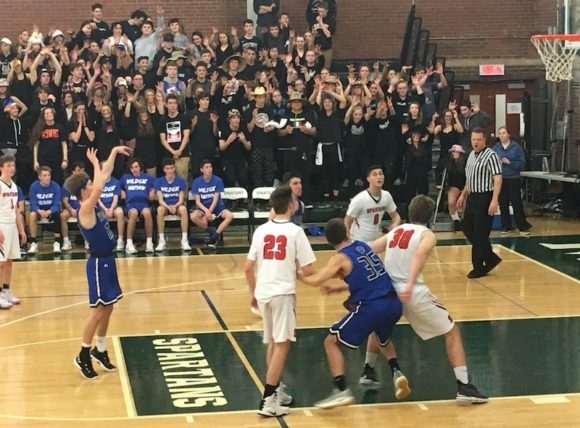 The other semifinal will see top-seeded Innovation play Old Lyme’s Shoreline Conference rival and No. 5 seed Valley Regional also at 7 p.m. at Bulkeley High School in Hartford. Photo by A Perry on Unsplash. This op-ed by Senator Chris Murphy (D-Conn.) was first published Feb. 25, by TheHill.com. In view of the MV2 (Meaningful Vote 2) regarding Brexit, which is being held today in the British Houses of Parliament, we felt its re-publication was highly relevant. 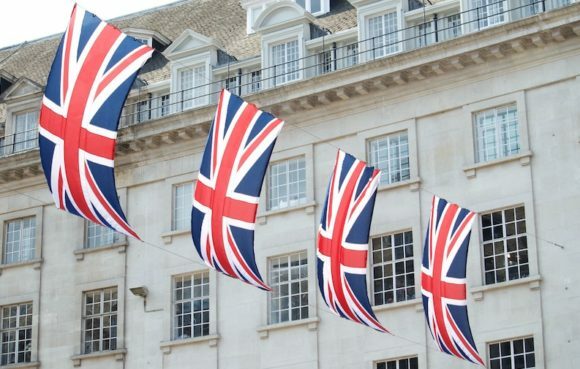 British Brexiteers and their U.S. cheerleaders promised a return to Britain’s glory days once they shed the bureaucratic constraints of the European Union. Steve Bannon celebrated Brexit as a victory for far-right nationalism and called for other countries to follow. The reality of Brexit, of course, is turning out to be entirely different. The economy will shrink by 7-10 percent, consumer prices will increase, unemployment will rise, and Britain will likely have to pay the EU to leave – not the other way around. Brexit will weaken Britain, the EU, and the entire Western alliance. The question now is whether we will throw our lot in with those who want to break up hard-won international alliances, or take a stand in favor of a closer partnership between America and Europe. It would be a disaster if the United States reacted to Brexit in a way that encouraged more countries to leave the EU or other international organizations. We should not take seven decades of European peace for granted. After centuries of never-ending warfare and two world wars, stability in Europe is a core interest of the United States. We should also not take for granted how the allure of future EU membership has kept countries on its periphery promoting positive economic and democratic reform. And Russia hawks in Washington should remember that one main goal of the Kremlin is to weaken the EU, the primary check on Putin’s hopes to restore the Soviet empire. This is why the promise of a U.S.-Britain trade agreement, as a reward for Brexit, is such a bad idea. We have no better friend or ally on the planet than Britain. But this special relationship does not require us to jump off the same building they are. Those arguing for Britain’s hard exit from Europe claim that the United States will ride to the rescue and deliver a trade agreement that will repair the economic damage done by Brexit. Russia cheers on this talk, because they know a U.S.-Britain deal might encourage other countries to leave the EU and expect a bilateral agreement with the United States as well. At the very least, U.S. supporters of a post-Brexit trade deal with Britain should make clear the negotiated Brexit arrangement must protect the Northern Ireland peace process. A key pillar of the Good Friday Agreement was eliminating physical barriers and security checkpoints between Ireland and Northern Ireland. Pulling the legs out from this agreement by reestablishing a hard border risks upending the delicate balance of compromises that has maintained peace for the last twenty years. Even new technological infrastructure to monitor movement could be inflammatory. Recent surveys have found extreme antipathy in Northern Ireland for any type of north-south border checks. With our large Irish-American population and uniquely close relationship with the UK, the United States played an important role shepherding the peace process and must continue to safeguard the Good Friday agreement. We should be firmly against any Brexit agreement that doesn’t include the Irish backstop or other arrangement to protect the peace process. When the UK government held the initial Brexit referendum, Brexit promoters implied that Britain could have its cake and eat it too. 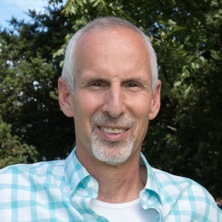 They claimed that Britain would make money by no longer having to contribute to the EU; that Britain would still be able to trade on favorable terms with the rest of Europe while being free from EU regulations; and that investment would continue to flow to Britain once it scrapped EU rules that were supposedly stifling their economy. It’s now clear that none of those things are true, and that very tough choices are now required. With this picture now clear, it would be wise to allow for a new referendum. In the United States, instead of cheering on Brexit and promising individual agreements that weaken the EU, we should be doing the opposite – binding ourselves closer to the EU and negotiating a trade agreement that establishes the U.S.-EU bloc as a dominant force. In the coming decades, the size of China’s economy and military will continue to grow. The only way to prevent China from dictating terms in a world where they have significantly more influence is to join forces with Europe to agree on global standards going forward. While the special relationship will endure, Britain’s position will be stronger from within the EU rather than outside it. The Irish poet Oscar Wilde once said there are only two tragedies in life: one is not getting what one wants, and the other is getting it. Nigel Farage, Steve Bannon, and their allies in the White House are close to getting what they want in Brexit, but the tragedy may yet be avoided. U.S. 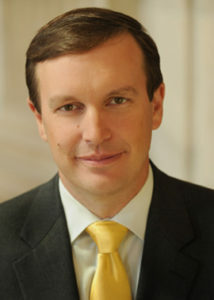 Senator Chris Murphy is a member of the U.S. Senate Foreign Relations Committee. Aedan Using was top scorer against Gilbert Thursday night. 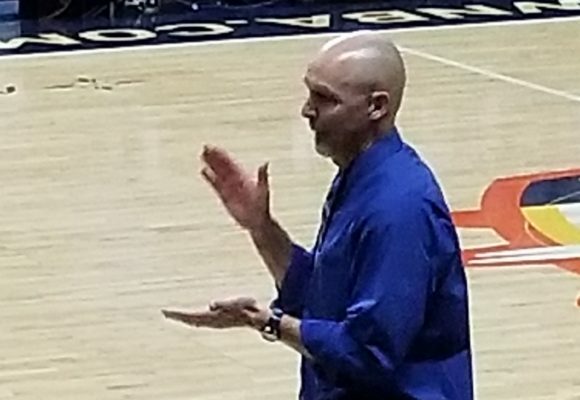 Seeded third in the CIAC Division 5 State Tournament, the Old Lyme boys’ basketball team bounced back into action Thursday evening after the disappointment of taking an overtime loss to Cromwell in the Shoreline Conference final March 1. 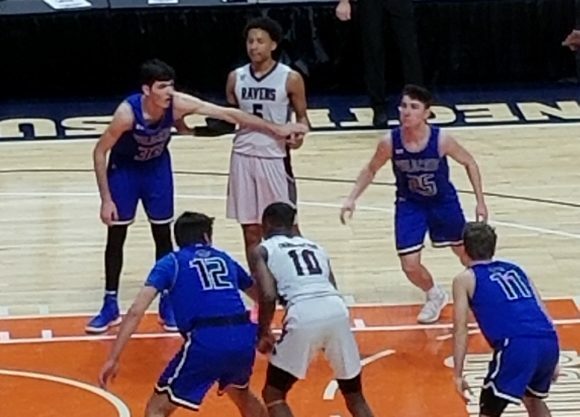 The Wildcats defeated #14 seed Gilbert 75-65. 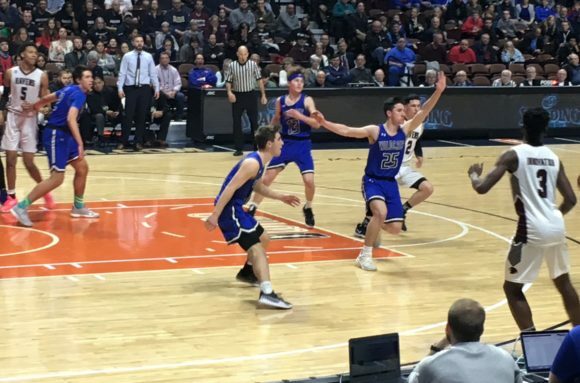 Aedan Using led all scorers with 25 points while Ray Doll, Quinn Romeo, and Brady Sheffield combined for 36. 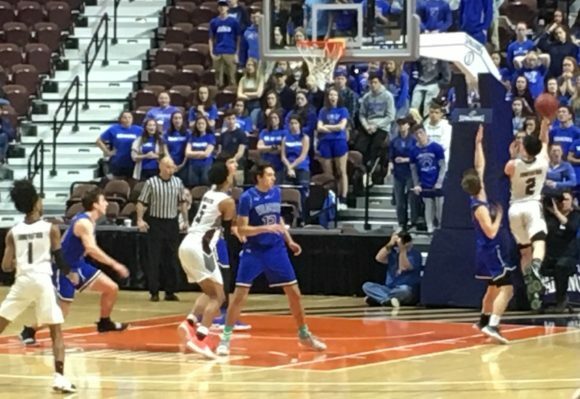 Old Lyme now advance to the quarter-finals of the tournament, where they will face the sixth-seeded Morgan School of Clinton this evening. That game will be played at Old Lyme. Photo by Malcolm Denemark/FLORIDA TODAY and published with permission of the Green family. “Catherine (Candy) Clifford Green, was a force of nature. 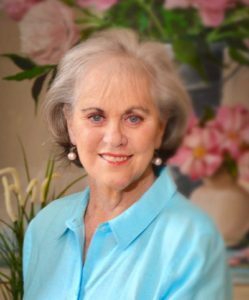 She was a lifelong lover of the arts and an active volunteer committed to public service. On Martin Luther King, Jr. Day in 2016, she was first diagnosed with ovarian cancer, but she never let the disease get the better of her. If her time was going to be limited, she wanted to be sure it was devoted to the things she felt were important – her family, civil rights and the environment. Candy died February 28, 2019, in Melbourne, FL. She was 74. She was born on Halloween in South Bend, IN, to Carol (Kidd) and Temple Clifford, both of whom predeceased her. Along with her daughter, Temple, she is survived by her adored grandchildren Tyler and Rylie Grace of West Melbourne, FL, her sister Julie Clifford (John Hanson), of Alexandria, VA, stepson Josh Green of New York City and her husband Keith Green. Her cousin Madelyn Young and a number of devoted friends provided invaluable support during her illness. Candy also lived in Atlanta, GA and New York, NY, where she had an award-winning 20-year career in advertising and public relations, which culminated as vice-president for broadcast and music production at Ogilvy and Mather. Candy was particularly involved with the Child and Family Agency of New London, CT, hosting and chairing the very successful Child and Family Garden Tour. She was named Volunteer of the Year in 2005. She also raised funds for the Lyme Academy College of Fine Arts. When she moved to West Melbourne in 2011, she continued her volunteer and community betterment activities, serving as a docent and volunteer at the Foosaner Art Museum, vice president and board member of the Space Coast Progressive Alliance, where she was active in planning many programs, and a member of the Brevard County Chapter of the Brandeis National Committee. Memorial donations may be made to the American Cancer Society, Child and Family Agency of New London, CT, theBrandeis National Committee, the Space Coast Progressive Alliance or the Foosaner Art Museum. Celebrations of Candy’s life will be held in Melbourne and Old Lyme.” We will provide details of the latter as soon as they are available.